(Phys.org) —Beyond reading body motions, Kinect is getting a workup by researchers at Microsoft, now showing substantial control additions. Microsoft Research this week showed how Microsoft Kinect for Windows may be used for picking up enhanced hand gestures. At this week's TechFest, the annual event revealing what Microsoft Research teams are up to, the Kinect capability for hand gesture recognition was unveiled. The presentation showed how Kinect for Windows allows more refined gestures that can translate on the computer screen as pinching, zooming, and panning around. The Microsoft Kinect for Windows presentation served to illustrate how, beyond gaming, the PC user of the future might perform digital work via hand gesture control. The mouse and touchpad, as predicted so often, might be replaced with technology that makes optimal use of a person's hands for professional work. The TechFest presentation made that expectation more palpable. 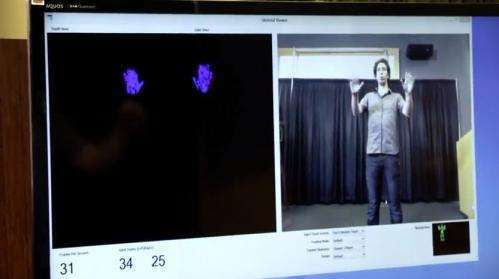 Microsoft Kinect for Windows was demonstrated with motion-sensing technology that can tell whether the hand is open or closed. The capability comes from the machine-learning approach to distinguish between the open hand and clenched fist. Varied images of people's hands were used to train Kinect to distinguish between an open and closed hand. Microsoft researcher Cem Keskin explained the workings of the hand-recognition features at the demo with the help of a big screen running Windows 8. The Microsoft Research site posted observations about where this project can lead: "The project uses machine learning to train Kinect to determine reliably whether your hand is open or closed. A handgrip detector, the gestural equivalent of the mouse click, then can be built. This detector will be included in a forthcoming release of the Kinect for Windows SDK and should open a new wave of natural-user-interaction applications." Kinect was first released for the Xbox 360 game console so that users could control their Xbox without a controller. The idea was to use Kinect through gestures and voice commands but it caught on with a wider audience. Those enthusiasts trying out Kinect were eager to use the sensor device for more than games. Microsoft in 2011 subsequently released a Kinect for Windows SDK. "The SDK is designed to empower a growing community of developers, academic researchers and enthusiasts to create new experiences that include depth sensing, human motion tracking, and voice and object recognition," said Microsoft at the time. Always remember. It was the incompetent Ball Boy, Ball Bly Ballmer killed you. Hands are pretty wide; Tablets are set to replace the rest completely when they become far more powerful; So, the question Remains. Mouse will Die. Hands can be used...but not a perfect idea, though! So, What is Next? Use a Stiff Rubber Mini hand to point at vertically positioned or laid on the floor Tablet? QUESTION OF PRIVACY ALSO EXISTS! Some appropriate stiff rubber mini hand which can be manipulated like we use flute with fingers...NOT EXACTLY. You get the Picture. Something Else apart from Bare hands when Mouse & Keyboards VANISH Totally from the Scene! Motion control will certainly have its uses in the future, but I dont think Kinect is up to the task. Even the new one is too low resolution and has too high latency.